John 8: 36 So if the Son sets you free, you will be free indeed. Cut the tissue into squares that are about 5 inches by 7 inches. (about 13 cm X 18 cm). Stack one sheet of each color of the tissue. Fold accordion style along the shorter edge until you come to the end of the tissue paper. Find the center and tie the thread or yarn tightly to hold the folds in place. Cut each end to a point through all layers of the paper. This will give the flower a star-burst appearance. Carefully separate the top layer until the paper is standing up to make the center of the flower. Separate the second layer so it stands out slightly from the bottom layer. You will find multiple uses for these flowers. 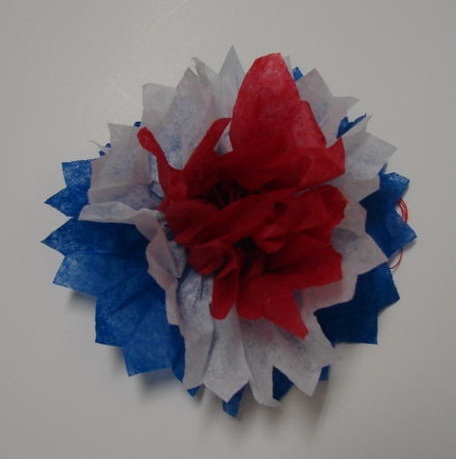 Insert a bobby pin and wear it to a Fourth of July celebration or use as part of a corsage. Scatter the flowers along a table for decoration. Fasten to a strip of paper for a napkin ring. Tape to a ribbon and hang as a streamer. Independence Day is a special day in the United States. It is a day to celebrate freedom. As Christians, we have an even greater freedom. Through Jesus Christ, we are set free from sin. Use this craft to go with our lesson.